Beau Bien Cherry Cranberry Preserves for sale. Buy online at Zingerman's Mail Order. Gourmet Gifts. Food Gifts. Cranberries really get to shine at Thanksgiving. As a matter of fact, it's the only time they get any spotlight at all! This year we've found something new for your turkey and it's made right here in Detroit. 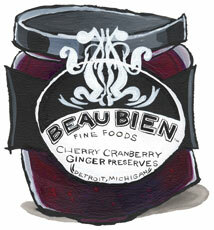 Beau Bien Fine Foods has been making preserves, mustards, sauces and more since 2010. For this seasonal preserve, they pair Michigan cherries and cranberries with a bit of ginger and cane sugar to create a spoonable sauce with a chunky texture and a bright, tart, gingery zip. Of course it's good on turkey (especially sandwiches made up of the leftover meat), but it's far more versatile than just a condiment. Try a dollop on soft, fresh cheeses or mix a few tablespoons with olive oil and vinegar for a Thanksgiving vinaigrette. Great with scrambled eggs or as a topper to a festive quiche. Like I said: it's versatile.